On 18 November, Startupbootcamp FinTech welcomes you to Johannesburg for Startupbootcamp FinTech Office Hours. Selected teams will be invited to pitch, get feedback and learn more about the Startupbootcamp FinTech Mumbai program. 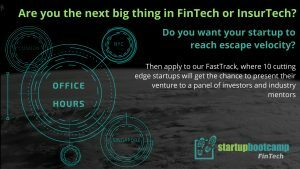 If your answer is yes, we at Startupbootcamp Fintech Mumbai would love to invite you for a one-on-one meeting with our team! This is an individualised meet-up between our team and your startup. You will have the opportunity to present your startup venture and afterwards get feedback from us. Not only that, you will learn more about our FinTech accelerator program held every year.